CSUSB will have its annual, “El Dia de Los Muertos,” event on Sunday, Nov. 5 at the Lower Commons Patio Arena, to honor and recognize those who have passed. This is what an altar looks like. “It’s a way to celebrate them and not forget about them as they have moved on to the next life,” said Administrative Analyst/Specialist, Iwona-Maria Luczkiewicz Contreras. At the event, there will be a community altar co-sponsored by Acto Latino as it has always been considered the centerpiece of the event. “We invite the spirits of our dead ancestors, relatives and friends to come visit us,” said Executive Director of the Latino Education & Advocacy Days (LEAD) Organization, Enrique G. Murillo. 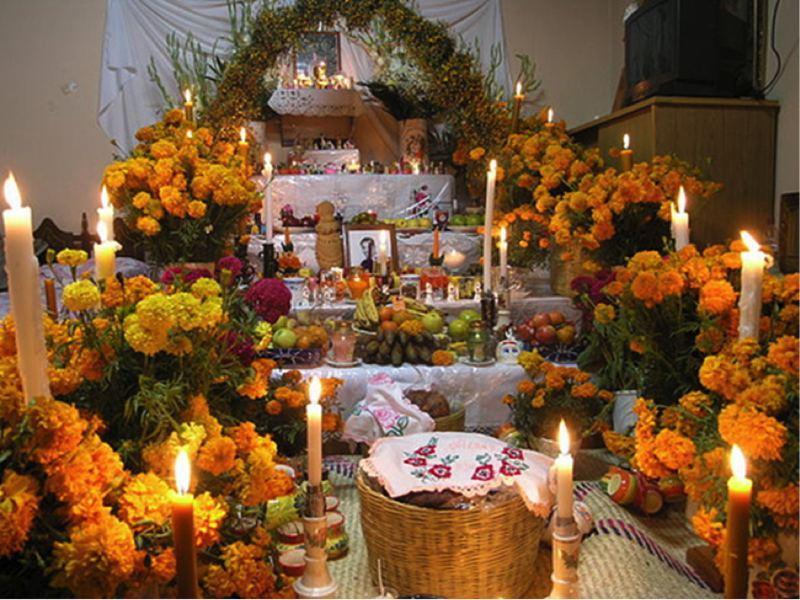 During the Day of the Dead, a portrait is placed on the altar as the visible presence of the deceased loved one. “If people want to bring pictures of their beloved ones and add to the altar, it’s all welcomed,” said Luczkiewicz. 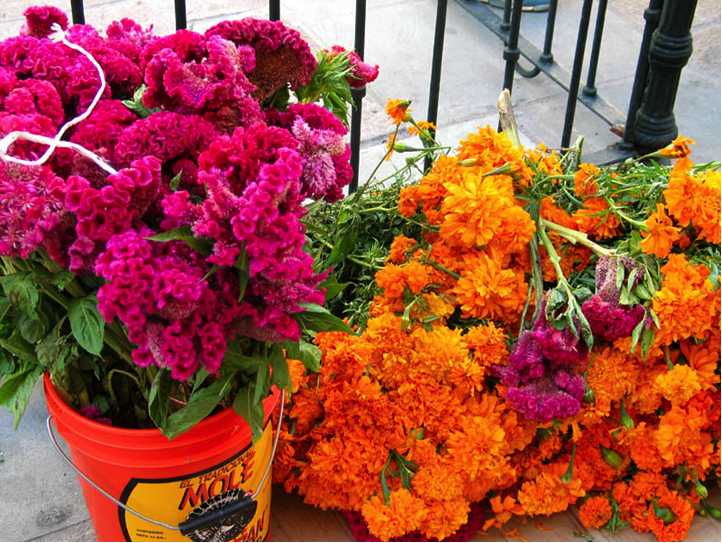 Marigolds (Cempazuchil) and Cockscomb (barro de obispo) are some of the main flowers that are placed on the altar to signal the portal between the land of the living and the land of the dead for the traveling souls, according to Murillo. “At the altar, we offer them their favorite drinks, food and we lay out important items, pictures and mementos that represent them,” said Murillo. Murillo has been building public altars for around 30 years and he enjoys doing it. His father recently passed away and he believes the Day of the Dead is a special event that brings peace to those individuals who have lost a beloved one. “Of course it’s really sad, but I feel connected to my father because I know I will always commemorate him through the Day of the Dead,” said Murillo. He said the Day of the Dead is almost part of being Mexican and an obligation to one’s family/ancestors to always maintain a connection with them. Marigolds (Cempazuchil) and Cockscomb (barro de obispo) are some of the main flowers that are placed on the altar. “Slowly, it’s been building up where it’s now celebrated all over the United States in unique ways that are not necessarily exactly how they do it in Mexico,” said Murillo. There are different kinds of altars that people build to honor their loved ones. Some people may have a private (home) altar which is just for the family. Others might have a family altar (cemetery) where people visit and clean the cemetery. There is also a public altar (community) for those individuals who have their loved ones buried elsewhere and for whatever reason cannot visit them. The Day of the Dead serves as an educational opportunity for everyone, as it intends to share some aspects of Mexican culture. Several individuals tend to confuse the Day of the Dead with Halloween because they have some similarities. 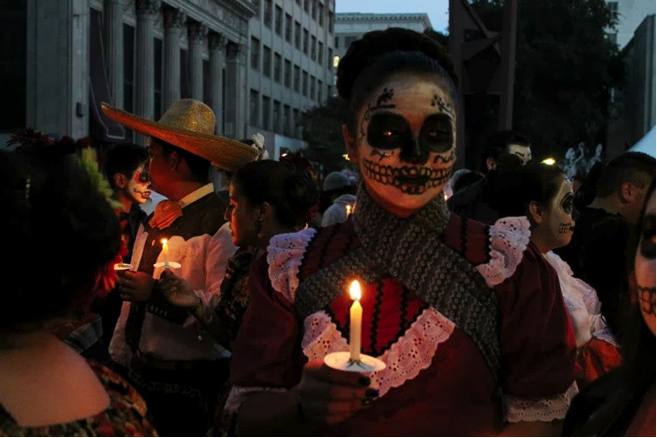 “The Day of the Dead is not Halloween, it’s a cultural event,” said Luczkiewicz. The Day of the Dead is said to be a personal celebration, but at the same time, an expression of tradition and belief. “Some children don’t necessarily understand that sometimes and they will come dressed in their costumes,” said Luczkiewicz. Luczkiewicz wants the younger generation to gain some knowledge about the Day of the Dead and not confuse it with Halloween. “It’s also a good way to bring student groups and community groups together to the campus and enjoy some of the fun activities,” said Luczkiewicz. Lizvett Gonzalez is a CSUSB student who has attended the event in previous years and will attend this year as well. “What encourages me to attend these events yearly is the community involvement” said Gonzalez. Gonzalez enjoys seeing different backgrounds and ethnicities being interested by the event. “I encourage people to attend this event because it teaches others about our amazing religious beliefs, brings the communities closer together, and it’s free,” said Gonzalez. At the event, there will be Folklorico/Aztec dancers, food, music, student clubs, games, activities, a community altar, Calaveras auction and an opportunity drawing. If people want to participate in the altar or volunteer for the event, they can contact the coordinator, Iwona-Maria Luczkiewicz Contreras at [email protected]. All the pictures are from; Executive Director of the Latino Education & Advocacy Days (LEAD) Organization, Enrique G. Murillo.